My husband and I have a now 4.5 year old. We have been taking him to Aruba since he was a year old. Adventure traveling is awesome, but sometimes you just need vacation to be easy. There are grocery stores near the Surf Club. We like Superfoods. 10 minute car ride. You can keep snacks, fresh fruit, and things that need to be refrigerated for your kids. You can buy what they like to eat so you know they won’t starve, especially if they refuse restaurant food or they need to eat earlier than everybody else. We used to scramble up an egg before we went out to dinner, (that was when our son ate eggs). No more cajoling at the restaurant. Eat, don’t eat, we’re in Aruba! We always bring snacks to dinner to keep him occupied so the rest of us can relax. You can make breakfast and lunch in the room – cheaper, faster, and easier for picky eaters. Who wants to eat 3 meals a day out with a toddler? There’s a regular size bathtub in the Surf Club Studio or 2nd bedroom and a deep soaker style tub in the 1,2 & 3 Master Bedrooms. Our son loved playing with his cousins & toys in the giant tub. Gotta scrub that sunscreen off every night, right? Cousins having fun in the bath! This helps with packing and you don’t have to worry about the spills and messiness that are definitely coming. If you’re in a 1, 2, or 3 bedroom. Of course your kid can nap in a hotel room, but then you are stuck in there with him/her being super quiet. In a timeshare, your kid can nap in the bedroom while you putter around the living room or kitchen. All the rooms at the Surf & Ocean Clubs have a balcony, so parents can read a book and/or have drinks in the 80+ degree weather while your bundle of joy is sleeping at naptime and in the evening. 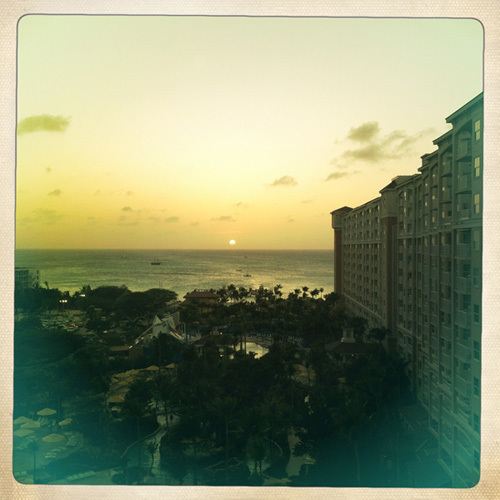 The sunset from our balcony at the Surf Club. Depends where it is of course, but the Surf Club certainly does! There’s an activity center for parents & tots & older kids to go by themselves, zero depth pools, a new zero depth pool with spray guns that my son loved. What kid doesn’t like getting other people wet? It also has a palm tree that dumps buckets of water. He did not love that, but lots of other kids did. 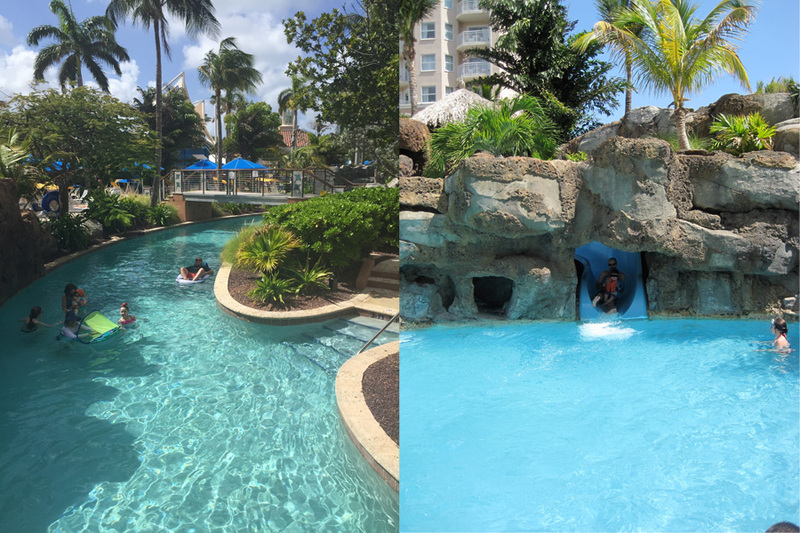 Floating down the lazy river & laughing down the waterslide! There is also a super fun waterslide at the Surf Club. My kid went down with my husband maybe a thousand times. 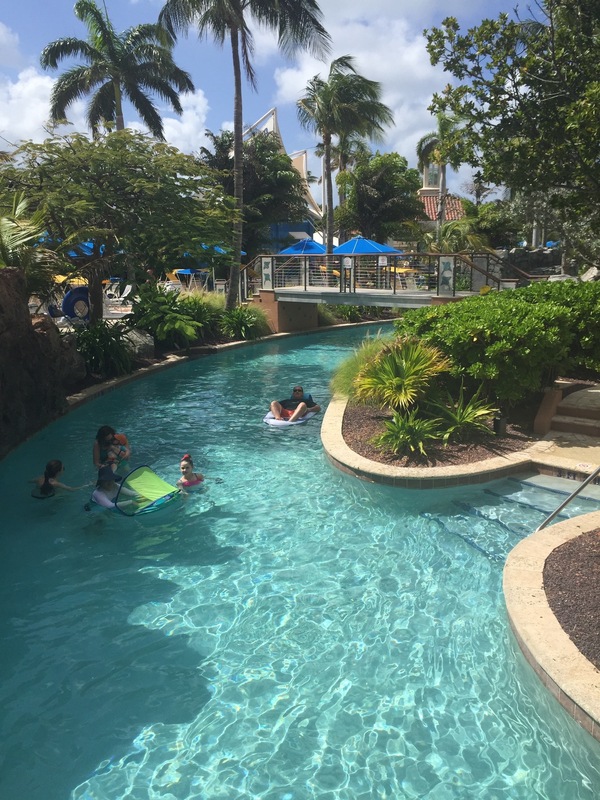 Do you have anything to add about traveling Aruba with kids?